Marfan syndrome often causes problems in the bones and joints—in fact, these are often the features that first lead a person to suspect Marfan syndrome and seek a diagnosis.These features (called skeletal features) happen when bones grow extra-long or ligaments (connective tissue that holds joints together) become stretchy—like loose rubber bands. What are the common types of bone and joint problems in people with Marfan syndrome? How are the common types of bone and joint problems treated in people with Marfan syndrome? How is treating Scoliosis different in Marfan syndrome? 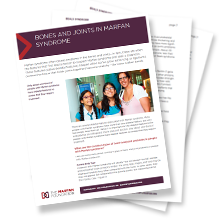 Find these answers and more in the "Bones and Joints in Marfan syndrome" download.